Sixty years ago Britons were celebrating the end of war in Europe, but the war in Asia carried on. The Japanese Army, having overrun much of the British empire in the east, had not surrendered. The Indian Army was the main contingent of the Allied Forces which eventually drove back the Japanese. Mark Tully, the BBC's former India correspondent, has been talking to some of the veterans of that struggle. In the small Punjab village of Nandapur Kalore, Sikh World War II veterans still meet regularly to relive their exploits in that war. Rifleman Jagir Singh told me how he had fought hand to hand with Italians, using the skills he had learnt as a village wrestler. Subadar Mansar Singh remembered with relish the party the Maharaja of Patiala threw for his regiment after the war. "There was Scotch whisky," he said with awe. The veterans had fought in the world's largest ever volunteer army - two and a half million strong. It was an army of Muslims - most of whom went to Pakistan after the war - Hindus and Sikhs. They served together in spite of the mounting religious tension in India which eventually led to partition. They ignored Mahatma Gandhi when he called on Britain to quit India in the middle of the war. Most of the Sikh veterans came from families with a long tradition of serving in the same regiment. More than one said to me: "For us the regiment was our 'ma baap' (mother and father)." But when war was declared, the traditional army they joined was not equipped or trained for it. The British officers of the Indian Army that I met all agreed with great good humour that life between the wars had been "laid back". I was told of a regimental elephant retained solely for officers' shooting parties. There was plenty of time for polo and everyone seemed to have their own horse. The cavalry were still mounted on horseback and pigeons were still used for communications. But those relaxed British officers and their Indian soldiers performed with great gallantry in World War I. And in World War II, the unique bond between British officers and Indian soldiers was the foundation on which an army 12 times larger was built - an army that recovered from the surrender of Singapore, endured the retreat through Burma (the longest in British military history) and went on to inflict the worst defeat Japan had ever suffered on land. The sudden expansion of the army brought many problems. An internal Indian Army document reveals that most of the men from outside the traditional recruiting areas were undernourished when they joined up. Unlike the Sikh veterans, they had no military background. A sergeant major couldn't understand why one recruit just was not able to march until he realised he was wearing two left boots. Between the wars, a limited number of Indians had been commissioned as officers. Now many more were needed. Although before the war there had been clashes between some of the crustier British officers and rightly sensitive Indians, friendships made during the war survive to this day. There was one serious collapse of morale. A large number of Indian soldiers and some officers, who were taken prisoner when Singapore was surrendered, did go over to the Indian National Army which fought alongside the Japanese. 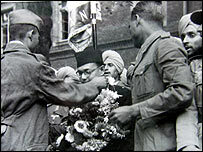 It was led by the charismatic Indian nationalist, Subhash Chandra Bose, who believed the Japanese could and would liberate his homeland. But the morale of the rest of the Indian Army held up. Wracked by malaria, consistently outwitted by Japanese - who unlike them had been trained in jungle warfare - deprived of food and water, the Indian Army still retreated through Burma in good order. Many of the officers I met said they were inspired by two of their commanders, Field-Marshall Viscount Slim and Field-Marshall Sir Claude Auchinleck, both Indian Army officers. The Japanese were eventually held at the battles of Imphal and Kohima on the Indian border. At one stage, the Japanese captured Kohima's water supply but the garrison held out. After the battle, Slim said: "In no siege have the defenders deserved greater honour than the garrison at Kohima." In the immaculate cemetery, surrounded by pine trees on the slope of the hill in the centre of Kohima, there are graves of not just Indian Army soldiers but also British African, and other Commonwealth soldiers, all of whom fought alongside the Indian Army in the Burma campaign. On a monument at the foot of the cemetery I read this inscription: "When you go home tell them of us and say for your tomorrow we gave our today." Sadly it has taken us a long time to say that. Slim's Fourteenth Army was known as the "forgotten army" and forgotten it remained. Even in the parade celebrating the 50th anniversary of the final defeat of Japan, one Indian Army officer, Colonel Bill Adams, found that he and other veterans were "left more or less to the rear". But now at last gates have been erected on Constitution Hill in the heart of London, commemorating the sacrifices of the soldiers from the subcontinent, from Africa and the Caribbean who fought for the Allies. From Our Own Correspondent was broadcast on Saturday, 7 May, 2005 at 1100 BST on BBC Radio 4. Please check the programme schedules for World Service transmission times.